The special offers and discounts listed here are posted by each individual business and are subject to change, limitations or expiration. Before purchasing, always confirm that the special is still in effect. Bring in 1- Comforter with sheet set- Sheet set will be cleaned for free. Bring in 2- Curtain sets and one set will be dry-cleaned free. Bring in 3 -Suits and 2 -Neck Ties for Dry-Cleaning, only pay for 2 Suits. 25% OFF Professional Leather & Suede Cleaning. Valid in March and April only! Stay 2 nights and get a third night free…free night offered Sunday through Thursday! 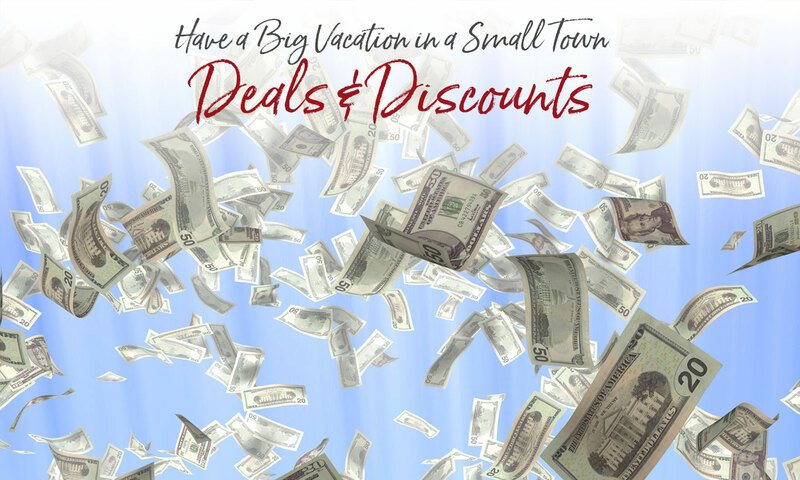 Plan a weekend visit and add either Thursday or Sunday at no additional cost! Offer only valid on new reservations. You must call us directly to book and mention this ad to get your free night! 25% off any two-night stay. Through April 30th. Excludes all previously booked reservations and April 18th-21st. 25% OFF Spring and Summer Sale (April thru September). We have several cabins open with hot tubs, creeks, fireplaces, campfire pits and beautiful views of the Smoky Mountains. Just minutes to Cherokee and Bryson City. Not valid on Holidays. Call today to reserve and receive your discount. 3 night minimum stay for discount to apply. Special 5hr Float Trip during prime time fishing hours on the Tuckasegee River for only $250.00 per boat! Our Float Trip Special includes everything you need to fly fish or spin fish, plus an experienced guide at the oars. We also include lunch and drinks! We have two start times to fit your schedule, 8:00am and 2:00pm! Get out on the water with the 2019 Fly Fishing Outfitter of the Year!